CHAIR: I recognize the hon. the Member for The Straits – White Bay North. Before I begin, I would like to pass along condolences to the Member for Lewisporte and the Member for Cape St. Francis on their recent losses. The Minister of Intergovernmental Affairs in speaking to the Interim Supply bill, as well as many other ministers here, have talked about and have asked us, the New Democratic Party, for our plan. What is our plan? The minister had said the same thing. I have to say, Mr. Chair, the Minister of Intergovernmental Affairs and all of the other ministers are managers of their departments, they have their employees. It is their jobs to produce the plans. They have failed to be putting forward with these plans. If they want our plans, they can hand over government to the New Democratic Party, Mr. Chair, and we will produce our plans. The hon. the Member for The Straits – White Bay North, to continue. I will talk about the gross mismanagement from the Progressive Conservatives on the other side. Newfoundland and Labrador‘s per capita spending increased rapidly between 2006 and 2010. Per capita spending averaged 50 per cent higher than all other provinces in Canada in the last three years, according to APEC. Again, I ask all members for their co-operation. I know the truth hurts sometimes, but I would appreciate if the members opposite would listen to the harsh realities of our fiscal situation. We are going to be well below budget in 2012-2013 in our oil royalties – no Atlantic Accord payments; this is going to intensify Newfoundland and Labrador to really curtail spending now because of lack of planning. In the 2012 fiscal year, there was a $436 million reduction in oil royalties. Mineral taxes dropped $114 million. Corporate tax revenue, which was in the Budget of increasing $200 million, dropped $47 million. The only thing that actually was really, really good last year was there was a $92 million increase in personal income tax revenue. Do you know why that is? It is primarily because of a commuter economy. Where is that going to head in the future with all of the layoffs government are doing right now? We are not going to have the personal income tax; that is not going to be coming in, not at that level. So, you have to be really careful when you are planning and doing a Budget. I ran a business, Mr. Chair. I know about making plans. Oil prices are set to decline by 6 per cent in 2013 and net debt, Mr. Chair, well, the former Minister of Finance had talked quite a bit about net debt. I want to say for everybody out there that net debt is the short- and long-term debt minus the cash and cash equivalents. If you are doing such a good job at managing the Province, we look at the fiscal position. The actual position for 2011-2012, every man, woman and child, net debt, dollars per capita: $15,257. Where are we forecasted this year: $17,329. Where are we going to be forecast the year after: $18,867. What about the year after: $19,497. That is being real fiscally responsible right there, taking on all that debt. Taking on more debt to build Muskrat Falls is going to increase borrowing and that is going to carry a lot of debt on a lot of carrying cost for taxation and interest there. We talked about the members opposite talking about: we cannot build an economy on volatility, you know – and that is exactly what they are doing. That is exactly what they are doing. They are risking it and it is looking at volatility. If we look at where we could go with this, Prince Edward Island, for example, tabled multi-year, three-year Budgets; where is this government going? We have no idea; we really do not, because they do not table any type of long-term plan. They say they have a Northern Strategic Plan for Labrador; we do not know what is being spent from year to year and how it is being balanced. It is not out there. It is not listed. There is no timeline. What about in the Transportation and Works Department, where they have capital spending for paving roads and things like that? We have no idea from one year to the next which area of the Province is going to get paving, and if it is an absolute need, and the things like that. The Nova Scotia government has a five-year plan. They have listed every road that is going to be getting paving and bridges. It is directly there; it is publicly available. Can the Minister of Transportation and Works stand up and say: well, we have a plan available. It is public. It is available. This government is not very transparent and not very accountable to the people who elected them. MR. MITCHELMORE: Muskrat Falls – I am glad you are saying that, somebody across the floor – $20 billion in revenues; well, what is the borrowing cost? MR. MITCHELMORE: What are the labour costs? Look at the expenditures that it is going to take over that time. MR. MITCHELMORE: Material cost, inflation – all of these things are going to have an impact on what is going to be the actual return. This is all at the risk of the ratepayers of this Province. Instead of looking at things, Mr. Chair – our renewable economy, like the fishery, as I spoke about in the first one; the Fisheries Minister is certainly managing the decline of the fishery. In 2003, when the Tories came into power, it was worth a billion dollars in seafood exports. In a decade, it is at its lowest amount: $740 million – no ideas, no plans, nothing structurally put into place. The same thing with the forestry; it is in absolute disarray. You talk about putting in investment. You put investment in my district, in Roddickton, in a pellet plant, but you did not go far enough with that. The Department of Innovation, Business and Rural Development, in planning that they put forward, when they recommended funding it was outlined there; it said, it absolutely said that there is going to be problems with transportation. It is going to be problematic, but they said, no, we will loan this money anyway, with all the other funders, without having a plan to make sure that this industry is going to be sustainable, that there are going to be personal income taxes coming from the forestry, that there will be corporate income taxes coming from the forestry, and that the Department of Natural Resources is going to get royalties from the logs that are actually being cut down. You have to really have a balanced portfolio when you go to the bank. You do not just buy stocks. You would not go and buy 100 per cent stocks in Google because Google might go down next year. You really want to have a diversified portfolio, and the Province is not really focusing on that. They put all of their eggs in that Muskrat Falls basket. They are not focusing on – they are actually working very hard to erode rural Newfoundland and Labrador by their lack of vision and their lack of investment. I certainly challenge the Minister of IBRD to get up on his feet and actually put forward that plan, because there is none. It does not exist. It really does not. It is very painful to see that the Ministers of IBRD and Natural Resources will not get together and actually make the industry on the Northern Peninsula, the forest industry, work. It can work for people. It can be millions and millions of dollars for the Treasury here. You are going to let it die and you are going to let those people go to Alberta and elsewhere. If we keep sending everyone away and sending our youth away, we are going to continue to have unsustainable health care, unsustainable, unprecedented spending, and there will be no way to turn around. Muskrat Falls will not save this Province, Mr. Chair. It really will not. This will not do it. It is not fiscally responsible and we need to see better; we expect better. The people expect better from their government. They really do, and people are getting sick and tired of hearing the same old rhetoric, the same old spin, and saying we have a plan when you really do not have a plan. If you are not prepared to govern and you are not willing to do it, then you are going to have to turn the reins over to somebody else who is willing to do it. NDP Fisheries critic Christopher Mitchelmore (MHA, The Straits – White Bay North) says he and his party fully support the commercial seal hunt and he is excited about the potential for the industry as a whole. Mitchelmore stated that when he meets with residents of his district there are ideas for new products but government will need to work with industry stakeholders to help these ideas develop into reality. “The people I talk to haven’t given up on the sealing industry, and I haven’t given up on the industry. If we work together innovation is possible and good years will lie ahead for sealers and everyone who wants to make a living in the industry,” he said. The sealing industry has declined in value from approximately $40 million in 2003 to $1.5 million in 2011, largely due to declining export markets. “If we have strong markets here at home, local businesses will be better situated to develop markets around the world. And the one thing we know is that Newfoundlanders and Labradorians support the seal hunt,” Mitchelmore said. 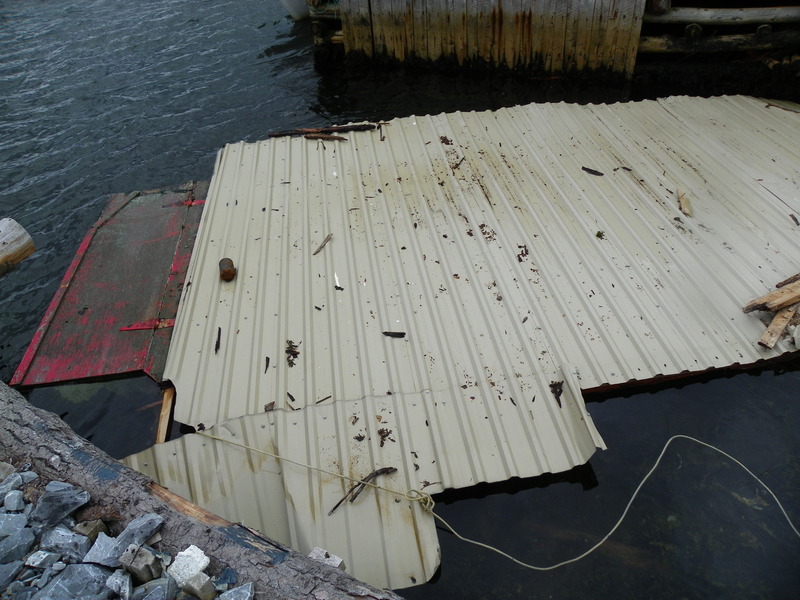 Christopher Mitchelmore, NDP candidate for the Straits – White Bay North calls on Government to take immediate action to help the Town of Englee by removing the old fish plant, which has now become a matter of public safety. For the past seven years, the Town has been trying to find solutions for the idle plant. It has been pressing the issue with the Provincial Government and other stakeholders. The Town has a commitment from the Federal Government, under Small Crafts Harbours Program to develop a new wharf. This could lead to additional harbour front developments and economic spin-offs, such as a fish market, waterfront shops and seating as the Town transitions to a budding tourism market in the region. The Town of Englee has been without a major employer since May 2004, when safety inspectors forced the closure of a dilapidated plant. In December 2005, the province determined a crab processing license for the Canada Bay region would be located in Englee. The Newfoundland and Labrador government approved an application from NFL Fishery in 2006 to open a processing plant. However, the new processing plant or license did not materialize for the Town as Government allocated these licenses elsewhere. In a Government News Release from July 2009, it was evident that the fish plant was designated as permanently closed as supports were offered to respond to community and individual assistance under the Integrated Transition Strategy for Displaced Plant Workers. The Straits -White Bay North NDP District Association holds its Annual General Meeting at 7:00 PM on Wednesday, August 10, 2011 at the Flower’s Cove Lions Community Centre at Flower’s Cove, NL. The District Association will Elect Officers to fill positions of President, vice-President, Secretary, Treasurer, Women’s Representative , Youth Representative and Members-at-Large. You may wish to join the party in advance by signing up at http://www.nl.ndp.ca/join. Your membership is free; however, we truly appreciate donations from our members. Remember your contributions are tax deductible! Christopher Mitchelmore, NDP Candidate for The Straits- White Bay North will provide an address. We look forward to your participation, hearing your ideas, issues and solutions that can better our communities.